Our service is what sets Steger's apart. We go the extra mile to make sure that after you make a purchase in our store we provide a flawless delivery experience. Every item we deliver is unpacked and inspected for any shipping damage. Then we carefully assemble and deluxe each item before it leaves our warehouse. Our warehouse and delivery team are well trained and we track and measure every delivery to ensure we are giving our customers the best possible delivery experience. 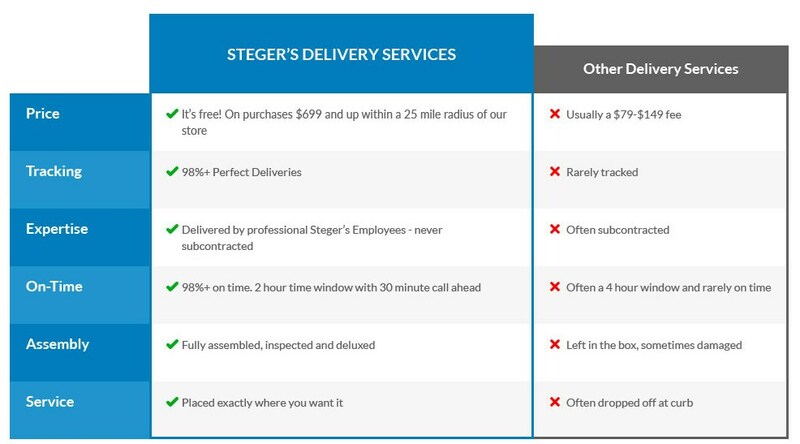 That's why all deliveries are handled exclusively by Steger's employees and never contracted out to a third party delivery company, allowing us to guarantee proper treatment of your home furnishings and satisfactory set-up. On top of all that, free delivery is offered on all purchases $699 and above, within a 25-mile radius of our store. At Steger’s we strive to have every item on our showroom floor in stock. To accomplish this, we have over two million dollars of our most popular items in our warehouse. This means that you can have your beautiful new furniture in your home in a few days, not a few months. Note: This only applies to items in our showroom, we are happy to special order items, but they will have longer wait times.